A big shout out from the Melbourne Football Club to all our fans in regional Victoria! It was a great feeling to be welcomed with excited faces and open arms by all the kids we visited during our recent regional school visits. Our men’s team ‘road tripped’ their way across the state last Thursday, flying to Albury on the Murray River, and travelling to Seville, Yarra Junction, Warragul, down to the Mornington Peninsula and across to Foster in the state’s east. From leadership talks, to gratitude talks, Footy Clinics and Healthy Eating sessions – our awesome country kids enjoyed kicking the footy, filling in the first page in their brand new My Heart Beats True gratitude journals (which they also get to keep – so cool!) and adding healthy foods to their My Heart Beats True placemats to take home and share with their families at dinner time. All our players, including Max Gawn, Jack Viney and Nathan Jones really enjoyed sharing everything that they have learned from school. As footballers, they loved being able to share how to kick a footy just like Christian Petracca, how to fuel your body with good, nutritious foods like Jack, and why we need to be grateful for everything we have in our world. Did you know that Max Gawn is grateful for his dog Charlie? Gawny told the kids at Tarwin Valley Primary School in Foster, that waking up to Charlie’s smile each morning always sets him up for a great day ahead! 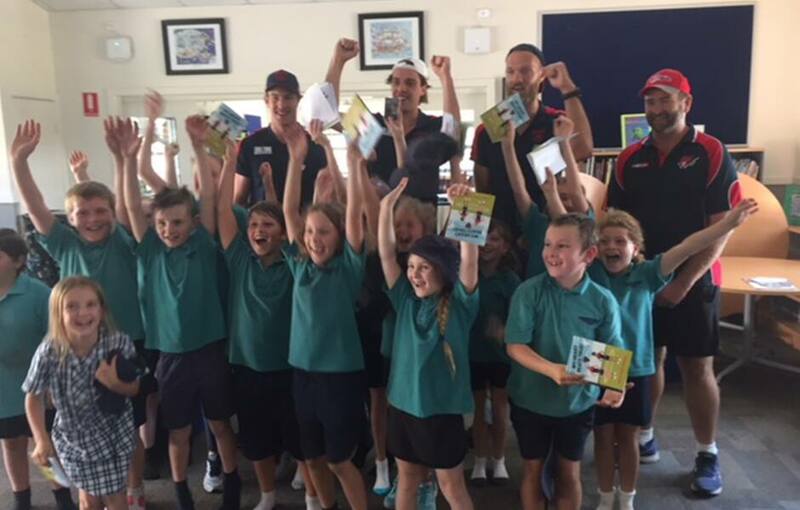 Max Gawn had a blast during his school visits! To all our school friends from the country - please let us know how you’re going with your gratitude journals – we wonder how many of you will get your Half Time Gratitude Certificates soon? The Melbourne Football Club would love to hear from you – please send us your comments and photos with your journals or placemats, or with something that you are grateful for in your life to heartbeats@melbournefc.com.au. You might just find yourself on our website! So thanks for having us come and stay for a day, regional Victoria! Now what’s next for our junior footy fans? Well, hold on, because the fun doesn’t stop yet! To all our fans in Casey, Stonnington, Boroondara and Glen Eira, be sure to look out for the red and the blue in your neighbourhood next week because we are COMING YOUR WAY….. Following our school visits in Casey on Wednesday, all the players from the Melbourne Football Club’s men’s team will be heading to our Casey Family Fun Night. This is going to be a super fun afternoon with opportunities to meet your favourite players, get photos and autographs, plus we’ll have Mario Kart races, AFL giant inflatables, giant Jenga and HEAPS more! So kids, come and let your heart beat true with the Melbourne Football Club during and after school this week – we can’t wait to see you!